Chazz in his "Black Thunder" outfit with the "Ojamas". Yu-Gi-Oh! GX Chapter 1: "A New Hero!!" Yu-Gi-Oh! GX Episode 1: "The Next King of Games"
serves as one of Jaden Yuki's rivals throughout the series. Chazz is considered Jaden's main rival in the same effect that Seto Kaiba is the rival of Yugi Muto. The two have Dueled one another a total of seven times throughout the seasons of the anime. Through his evolution, he goes from being a Duelist who only respected powerful cards to a duelist who believes that there can be effectiveness in any card. In the manga, Chazz originally serves much the same purpose as in the anime, but later becomes a deuteragonist. Chazz's design incorporates multiple layers of clothing and a wide range of expressions. Depicted here is the duelist in both his personal outfit and full Obelisk Blue regalia from the front, side, and rear alongside views of his head from different angles. 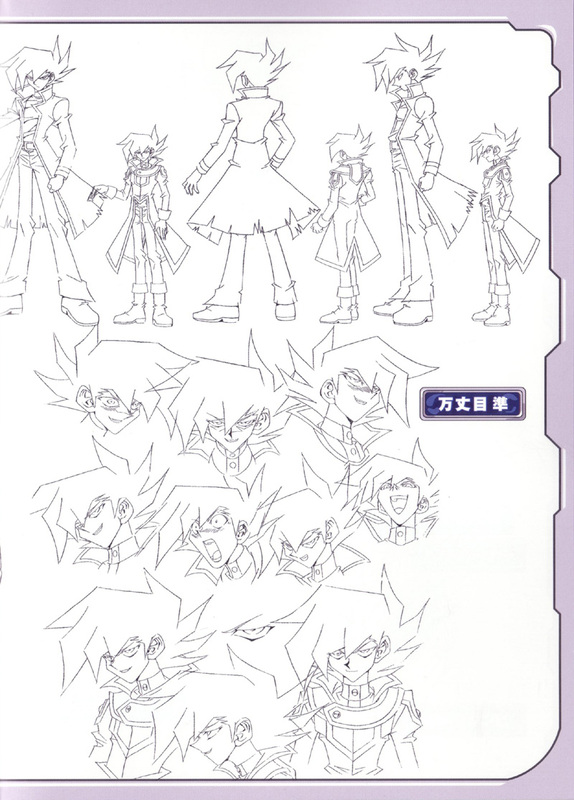 Chazz's character design was overseen by Kenichi Hara. His usual outfit consists of a slightly tattered black jacket with grey trimmings and sharp edges over a purple shirt, dark blue pants and brown shoes. Though he has also worn the standard Obelisk Blue uniform, flowing out the costume's lower back. His black hair is sectioned in two layers, his black eyes positioned directly beneath the bangs of the layer closest to his face. He carries an Academy-issued Duel Disk on his left hand. In the beginning of the anime, Chazz is a selfish duelist who believed himself to be the most elite duelist in the school. He is the youngest of three brothers, with his siblings Slade and Jagger, heads of the political and financial worlds, respectively. Due to this fact, Chazz is pressured into becoming the head of the dueling world to ensure the superiority of the Princeton family name ("Manjoume Group" in the Japanese version) worldwide. Despite having access to rare cards provided by Vellian Crowler, Chazz is defeated by Jaden Yuki early on in the first year. He is then overwhelmed by Bastion Misawa, and eventually became so dispirited and confused from his losses that he left Duel Academy to enter North Academy. There, he defeated the top duelists and becomes the "king" of the school. It is at this time that he gains the catch phrase "Chazz it up," while in the original version of the series it is "iichi, jū, hyaku, sen, Manjōme-sandā" (一、十、百、千、万丈目サンダー meaning one, ten, hundred, thousand, Manjoume Thunder), which serves as a pun given that the "Man" portion of his surname is the symbol for the number ten-thousand, and is preceded by the numbers one (ichi), ten (jū), hundred (hyaku), and thousand (sen). In the latter case, he also acquires the moniker "Manjoume Thunder" (万丈目サンダー; Manjōme Sandā). 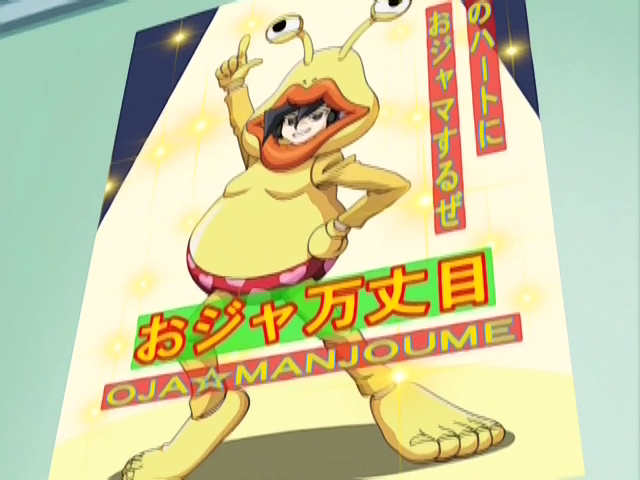 Due to his insistence that he be addressed respectfully, he often finds himself correcting others who merely call him "Manjoume" by saying "Manjōme-san da!" ("It's Manjoume-san! "; "-san" being a Japanese honorific). The students of North School, however, mistook the title as "Manjoume Thunder" ("sandā" being a Japanese pronunciation of the word "thunder"), and the name stuck upon his return to Duel Academia. In the English version, he often refers to himself in the third person as "The Chazz", and at times uses the phrases "It's go time" and "You go bye bye". While in the Society of Light, he occasionally uses the taunt "Bada-bing! ", a reference to the same phrase being used by Lorenzo, with whom he shares a voice actor. Chazz in his original Obelisk Blue outfit. Acting as North Academy's representative duelist, he was defeated again by Jaden, but realized the errors of his ways and was finally able to take charge of his own life (during the duel, Chazz tried to win on his own by using the Deck given to him from North Academy for the duel as opposed to the Deck that his brothers wanted him to use). He was welcomed back to Duel Academy, but forced to restart his studies out of the Slifer Red dorm. From the ordeal, Chazz obtains a spirit partner in the form of "Ojama Yellow", who Chazz finds annoying. He becomes a marked threat after becoming the North Academy representative but after that becomes more and more a comic relief character. Despite all this, it is important to remember just how dangerous an opponent Chazz can be. At the start of his third year, he had beaten every one of North Academy's elite duelists as well as a the vast majority of the Obelisk Blue dorm. Quite possibly his most impressive win was when he dueled one of his older brothers, and despite the imposed handicap of being able to only use monsters with attack points of 500 or less and going against his brother's Deck of very strong cards, Chazz still won with a Deck of all 0-ATK monsters. While he always seems to come out just behind Jaden, Chazz is possibly the second most talented permanent student in all of Duel Academy. Due to his dueling skills, Chazz is chosen as one of the seven keykeepers charged with keeping the Shadow Ridersfrom reviving the Sacred Beast cards, and later faces Slade in a duel to determine ownership of Duel Academy. In the chain of events leading up to the duel, Chazz finds "Ojama Black" and "Ojama Green", both of which join "Ojama Yellow" as his spirit partners. During this time, his feelings for Alexis Rhodes also become common knowledge; he constantly chases after her, love-struck, despite her protests. In the original version of the series, Manjoume even goes as far as to address her brother Fubuki as "onii-san," treating him as though he were his brother-in-law. During the second year, Chazz duels Sartorius for the opportunity to rise to the Pro-Leagues, but loses. As a result, he joins the Society of Light, acting as Sartorius' means of converting the top students of Obelisk Blue and Ra Yellow. In the Japanese version, his nickname becomes White Thunder (ホワイトサンダー; Howaito Sandā) from that point on until his defeat in episode 88. However, his love for Alexis Rhodes still continues, to cause him much embarrassment. He, whenever possible, humorously tries to convince Syrus, Bastion, Tyranno Hassleberry, andAlexis to join the Society of Light, eventually defeating both Alexis and Bastion, thus forcing them to join. After beating Bastion, Chazz discards his Ojama cards, considering them to be too weak. Chazz alongside "Armed Dragon LV10" while in theSociety of Light. After seeing Chazz's ruthlessness when he defeats Pro League duelist Gelgoduring the Genex Tournament with the new White Knight (白騎士団, Shirokishi-dan) Deck given to him by Sartorius, Jaden duels him with the cards that he himself once used: The Ojama Trio. During the match, Jaden shows Chazz his old black uniform, and Chazz eventually regains his senses, tearing off his white coat to don his signature black one once more. Chazz, back to his old self, retrieves the Ojama Trio to destroy "White Knight Lord", the card representing Sartorius' evil, but in doing so, willingly loses the duel to an effect of "White Knight Lord". Again in the Japanese version, following the battle, he dons his former outfit, revived as Black Thunder (ブラックサンダー; Burakku Sandā), though others continue calling him by his first nickname in the series. After his defeat in the English version he realizes that while he was in the society he defeated Alexis and vows to rescue her from the Society of Light. After Chazz realizes he was blinded by Sartorius' powers he had no memory of the earlier parts of the duel, in fact when Chazz saw "Ojama Yellow" on Jaden's side of the field because of the fact he couldn't remember the time he spent in the Society of Light he thought Jaden stole his Deck. Also it's revealed that as a Slifer Red Chazz acts more like a slob because when he was still his old self he used his old black jacket to wipe up food from the cafeteria. It's also revealed that unlike he is made to believe Chazz harbors a great deal of dislike for the color white. In episode 102, Chazz, with the assistance of the remaining Obelisk Blue students, takes on the Society of Light's members to make amends, winning their Genex Medallions in the process. They successfully return most of them to their former selves, releasing Duel Academy from the Society's grip, but before Chazz is declared champion of the Genex Tournament he is challenged by Blair Flannigan, who had come back to Duel Academy in hopes of officially entering Slifer Red. He defeats her, and is therefore allowed to return to Obelisk Blue. In the end, he still returns to Slifer Red after he is accidentally drenched in paint while the Obelisk Blue students are re-painting theObelisk Blue dorm. Alexis believes it is because he doesn't want to help re-paint the dorm. Shortly after the beginning of the third year, Chazz, irked by the superiority and secrecy of the Gecko family, forcesAdrian Gecko into a Survival Duel wherein the participants are standing on platforms suspended from helicopters. Although he puts all his strength into attaining victory, he is knocked off his dueling platform and into the lake with his opponent's final strike. After Duel Academy is pulled into an alternate dimension, Chazz and the rest of the cast are left to watch the Academy while Jaden and the foreign champions go out to find medicine for Blair's illness. When the Academy itself comes under attack from zombified students, Chazz is unable to repel them indefinitely, and becomes one of them. During his time as a Duel Ghoul, he has his fifth duel with Jaden, which he loses. He recovers after Duel Academy is returned to its proper place. When Jaden decides to go rescue Jesse Anderson, Chazz, along with Bastion, Alexis, Syrus, Atticus, Jim Crocodile Cook, and Axel Brodie, willingly volunteers to join him into the other dimension. Later on, Chazz is sacrificed when Jaden duels against Brron, along with Alexis, Hassleberry, and Atticus. Chazz is later revealed to be alive, trapped in another alternate dimension by Yubel. 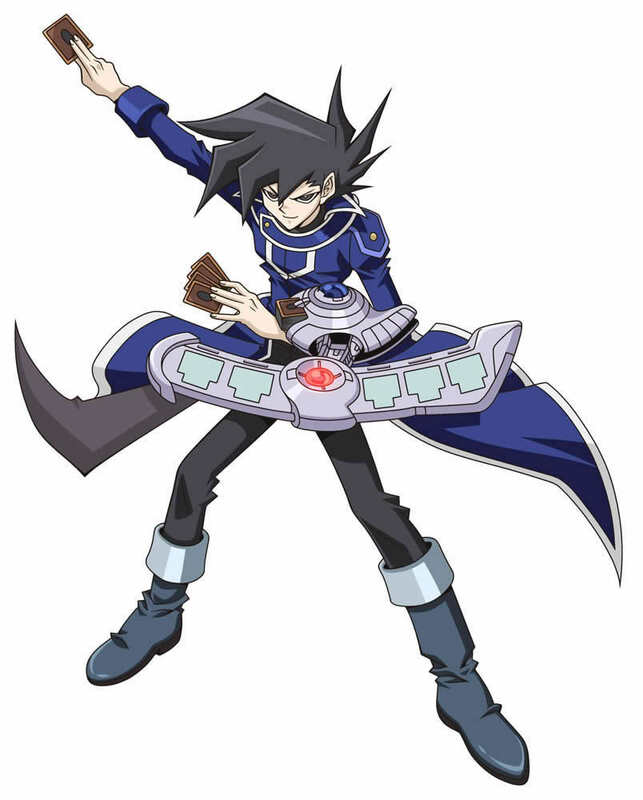 Chazz as the Pro Duelist, "Ojamanjoume." At the beginning of the fourth season, Chazz is promoted to the Obelisk Blue dorm along with Blair and Syrus. He still has his childish crush on Alexis, as indicated by how much he wanted her as partner during the pair Duel tournament, resulting in an argument with Syrus. Because of this, both he and Syrus end with no partner, and they sit the tournament out. Chazz also has plans to be a Pro League Duelist without the help of his brothers. Aster takes him as his student and teaches him about the stressful life of being a Pro League duelist. After Chazz gets Aster's final Destiny Hero stolen, he talks toMike, who tells him to go to Duel Academy in Aster's place. Chazz goes on to duel the Academy's strongest student, which happens to be Jaden. During this duel, Chazz realizes that learning about the cards does help with a duel and Chazz would have defeated Jaden with "Chthonian Polymer" if Mike didn't intervene and tell Chazz that all he had to do was give the audience a few laughs. Aster loses his position in the Pro Leagues and ends up dueling Chazz because of his mistakes. During their Duel, Jaden intervenes and clears things up for the guys and Aster receives the "Final D-Card", "Destiny End Dragoon". Although he Summons it, Chazz Summons "Armed Dragon LV10". Chazz wins by using "Ojama Yellow" to direct attack Aster, dubbing him his "ace" and kill off the rest of his life points with "Pride Shout", a most impressive win under Chazz's belt. During Trueman's siege, he is one of the last students to be defeated and sucked into the World of Darkness. In it, Atticus was shown the darkness within Chazz's soul. He was dueling in the pro league, however he was driven into a situation where he was forced into cheating. Therefore, his darkness was that he wanted to win whatever it takes, the very same reason he joined the Society of Light. To further elaborate, Chazz and the rest are attacked by multiple copies of Trueman who is trying to get everyone mind controlled, while Jaden is not there to stop him. Eventually, Chazz, along with Mindy, Jasmine, Alexis and Atticus were the five remaining students in Duel Academy who were not consumed by Darkness. Chazz and Atticus bought time for the other three by dueling against Trueman. Although the duel is not shown, it can be assumed that it took awhile. Atticus was cornered and defeated before he was, despite his duel starting much earlier. After his defeat, he is consumed into Darkness. Along with Syrus and Alexis, Yusuke Fujiwara initially has difficulty trying to get him to reveal the darkness in his heart. However, after placing him in illusions of failing in his career as a pro, having to quit, and then losing to a gang of Rare Hunters (apparently going under the same name as the gang in the original Yu-Gi-Oh! series) in an ante-duel. Each of the duels were nearly identical, with the last turn always being a choice between using the Spell Card "Reload" and Summoning "Ojama Yellow" in defense position, before he lost due to his opponent attacking with "Mad Sword Beast". Eventually he cannot take it anymore, and he is forced to resort to cheating by drawing the second top card of his Deck and if he unintentionally did this during a Pro League match due to his anxiety, he will be banned forever from the Pro League. Should he finally be forced to retire, he will be relieved from all the suffering he had to endure and when this was shown in the World of Darkness, his soul is shown consumed by a black wave of darkness. This illustrates Chazz's fears of not living up to the expectations of his family as well as others, as that is the theme of his darkness illusion. He is revived as Jaden defeats Nightshroud. Chazz is last seen at the Graduation Party in episode 179. He, Alexis and Syrus end up tying in points in graduation matches. This gives all three of them the right to the copy of Yugi Muto's Deck, but all three opt not to take it, preferring their own Decks. In episode 180, his note to Jaden reads "Come whenever you want and let's duel!" Main article: Chazz Princeton (manga)Chazz in the manga. In the manga, Chazz serves as Jaden's rival, but the rivalry is more competitive and his role in the story is greater than that of his anime counterpart. In Yu-Gi-Oh! GX Tag Force, Chazz begins the game in Obelisk Blue, and will not speak to the player while he is in that dorm. He leaves after losing to Bastion, much like in the anime, and returns after the interscholastic match, donning his signature black coat. At this point, he will speak to the player, and can be selected as a partner. Upon getting his heart level to full, he gifts the player with an "Ojamagic" card. When not selected as a partner, he ends up dueling alongside Jaden during the tournament. During part 3, he is brainwashed by Don Zaloog and functions as that character's partner. He is returned to normal upon Zaloog's defeat. Chazz's Deck changes the most of any Yu-Gi-Oh! character, evolving and growing as his circumstances and outlook on dueling shift. His initial Deck is a Hell Deck, consisting of powerful Fiend and DARK monsters, including "Chthonian" monsters. This Deck isn't seen at length but appears to have several control elements to it, "Chthonian Polymer" and "Chthonian Soldier" turning an opponent's powerful monsters against them, and "Mefist the Infernal General" and "Helpoemer" discarding cards from the opponent's hand. During a school exhibition duel, Vellian Crowler gives Chazz the "VWXYZ" series with the intent for him to humiliate Jaden. These cards focus on combining and fusing together to form powerful Fusion monsters. Chazz draws the needed monsters into his hand with "Magical Mallet", then summons them to the field quickly by using "Frontline Base", or discarding them to be revived. When he arrives at North Academy deprived of his Deck, Chazz is forced to scavenge cards from the grounds to make a new Deck. This Deck relies on a One Turn Kill strategy, such as a combo of "Inferno Tempest", "Chaos End" and "Return from the Different Dimension". At this time Chazz acquires "Ojama Yellow" as his spirit partner. As a prize for becoming North Academy's top duelist, Chancellor Foster grants Chazz the "Armed Dragon" series. This deck focuses on evolving the "Armed Dragon" monsters into stronger forms and using their effects to destroy opposing monsters by discarding cards from the hand. When Chazz's brothers attempt to buy out Duel Academy, Chazz is forced to duel Slade using a Deck of monsters with only 0 ATK. He gathers cards other students have thrown into the Reject Well and forms a largely defensive deck, protecting himself with monsters with high DEF and limiting Slade's attacks with "The Dark Door". Chazz also acquires "Ojama Black" and "Ojama Green", completing his "Ojama" trio and beginning to make regular use of them in all future Decks. At this point for much of the rest of the series, Chazz combines all his previous Decks together, interchangably using his "Ojama", "Armed Dragon" or "VWXYZ" cards. He uses a Power deck that is continually supplemented with more and more support cards for the themes, largely using his "Ojama" cards as support for his "Armed Dragon" or "VWXYZ" cards, such as with "Ojama Ride". While serving Sartorius, Chazz adds the "Beetron" cards to his Deck, along with "White Veil" and "Infernal White". Sartorius later grants him a "White Knight" Deck centering on "White Knight Lord". Unlike previous Deck themes, Chazz does not keep the "White Knights" once he leaves the the Society of Light, though he still makes brief use of the "Beetron" cards. 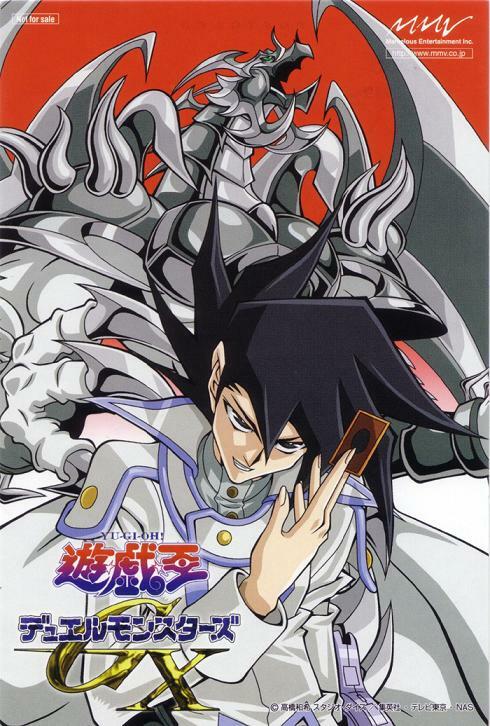 In the manga, Chazz uses a Dragon Deck, with his signature card being his Spirit Partner, "Light and Darkness Dragon". ↑ Yu-Gi-Oh! GX Episode 112: "Head in the Clouds: Part 2"
↑ Yu-Gi-Oh! GX Episode 39: "The Dark Scorpions"
↑ 3.0 3.1 Yu-Gi-Oh! GX Episode 44: "The Seventh Shadow Rider"
↑ Yu-Gi-Oh! GX Episode 24: "The New Chazz"
↑ Yu-Gi-Oh! GX Episode 165: "Aim for it, Manjoume! The Path to a Pro Duelist!" ↑ 6.0 6.1 Yu-Gi-Oh! GX Episode 166: "Armed Dragon VS Dragoon D-END!" ↑ Yu-Gi-Oh! 5D's Episode 98: "Power Plays"